Exotic yet functional in design and having the raw power to take on other top tier players. Furthermore, taking the title for the thinnest laptop that features true mechanical keyboard and NVIDIA® GeForce® GTX 1070 SLI graphics configuration. These are just some of the qualities that makes a machine worthy to own. The AORUS X9 is born. Attractive, striking and out of the ordinary. 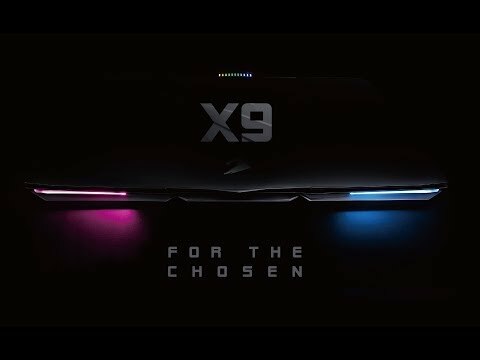 The X9 design philosophy screams with exotic properties, taking cues from modern supercars and stealth fighter jets, the beautifully shaped aluminium expresses unique flowing motions, standing out from the crowd that are full of mundane designs. You have fought to victory and desire to be different. The X9 is designed to be an expression of your untamed characteristic, it is surely for the chosen. A one-of-a-kind central RGB HUD that is not just for show. Extra information such as the volume, battery indicator, CPU/GPU temperature and more, can be shown through the individual RGB strip that makes up the AORUS HUD. You can also set the HUD to sync with the surrounding RGB chassis lighting to create the all-around effect to your liking. RGB lighting is normally found on keyboards. Now with the X9, we have surrounded the chassis with four RGB LED strips that has a multitude of lighting effects for you to choose from. Beyond the stealth of the X9, comes the option to light up the exterior for that extra eye-candy and make the X9 truly yours. 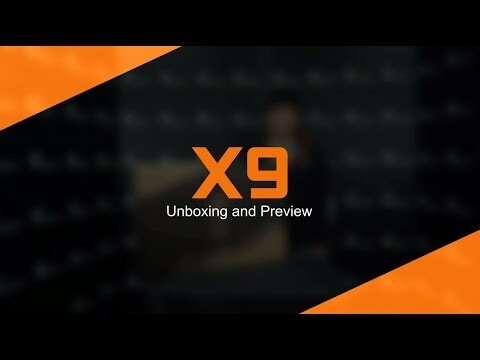 The X9 takes no compromises when it comes to the built material. You will find quality aluminium contractions throughout the X9 chassis, AORUS has gone through a tremendous amount of great engineering in order to create a chassis that is well built without sacrificing performance, opting for aluminium for areas that would normally be built with lower quality materials. Feel the difference. The 7th Generation Intel® Core™ i7 Processor outperforms its predecessor in every aspect. Added with HEVC10b and VP9 decoding for that extra 4K playback smoothness. The Intel® Core™ i7-7820HK greets CPU intensive games with ease. 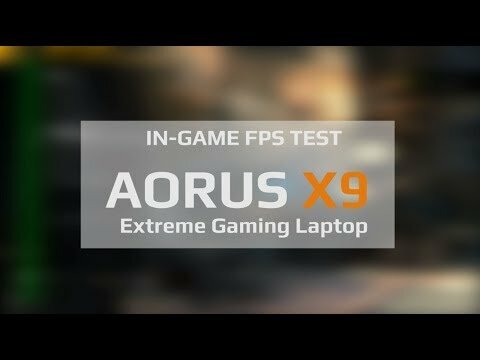 AORUS further presents one click overclocking ability that increases your CPU speed of up to 15% over the Intel 7700HQ CPU. Experience seamless next generation gaming performance. Combining the near-zero access times and high transfer speeds of PCI-E Gen 3 NVMe SSDs with the bulk storage capacity of traditional mechanical hard drives is AORUS' Tri-Storage technology. Capable of Running not one, but two 512GB NVMe M.2 SSDs, with blazing transfer speeds of over 3000MB/s ensures your operating system, applications and games launch instantaneously, while bulk storage needs are taken care of by up to a 2TB 7200RPM HDD. With a total of 4TB storage at your reach, giving you the ultimate flexibility and performance. With 4 DDR4 slots, the X9 doesn't leave you stranded in the future when time comes to fit more RAM, allowing for future upgrades up to 64GB of DDR4-2400, transferring at a speed of 17GB/s and producing less heat compared to the previous DDR3. Be ready for any RAM intensive games, anytime. • Thunderbolt 3: The Thunderbolt™ 3 comes with outstanding capabilities such as transfer speeds up to 40Gbps and connecting plug ‘n’ play external graphics. The Thunderbolt™ 3 is the most powerful compact and versatile port to date. • USB 3.1 Type C: Not only is it easier to connect, it’s fast. USB 3.1 Gen 2(Type-C) has twice the throughput of USB 3.0, transferring 100GB video in as little as 80 seconds. • Mini DisplayPort 1.3: Up to 32.4Gbps bandwidth, supporting higher than 4K outputs and higher colour applications than before. • HDMI 2.0: The incorporation of HDMI 2.0 brings screen resolution to the next level. Unlike HDMI 1.4 which only supports 8-bit colour up to 30 frames per second, HDMI 2.0 Supports up to 18 Gbps transfer. 4K resolution plus 12-bit colour and up to 60Hz refresh rate lets you view videos, photos, and play games in true high definition. With two NVIDIA® GeForce® graphics in SLI, you get an astounding 4096 CUDA cores built around NVIDIA's latest Pascal architecture, for truly extreme gaming performance. Comes with a beasty combination of 8GB+8GB GDDR5 memory, ensuring there are enough of VRAM to play the latest and greatest games at full 4K resolutions. Take all this power on-the-go in the world’s thinnest laptop with NVIDIA® GeForce® GTX 1070 SLI. The QHD display (2560x1440) provides the most immersive and accurate gaming experience running at 120 Hz refresh rate, along with a 5ms response time providing a crisp, smooth & vivid picture, with amazing colour accuracy. Enjoy the most fluid gameplay and achieves the highest FPS possible on the ultra-fast laptop display. With its crystal clear images, see clearer, act faster, to dominate your favourite FPS or racing game. The complexity of in-game colours is what brings the game to life. Without proper colour calibration, the intended colours are well hidden away. AORUS has teamed up with X-Rite™ Pantone®- a world-renowned authority on colour and provider of leading colour technologies- to provide accurate colours throughout the colour spectrum. Each display on the laptop is fully calibrated through a professional calibration solution from X-Rite™ Pantone®. Experience vibrant yet accurate colours shown as intended by game developers. Gamers can now enjoy every gaming moment and also take advantage of the accurate colour contrasts in order to distinguish between enemies from the environment. *Calibration environment: Display brightness: 100%; System operation: Windows 10 Home; Calibration device: Provided By X-Rite™ Pantone®, Designed especially for AORUS. 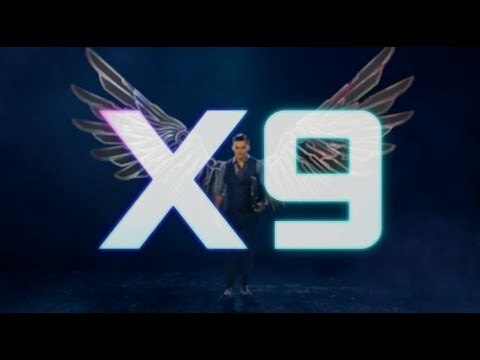 Open up to more possibilities with the X9. With the introduction of Thunderbolt™ 3 port, you can now connect up to a total of 3 external 4K displays. Watch a strategic gaming video while gaming, check and control your music without exiting the game or go all out immersive with NVIDIA® Surround. Do more and enjoy more, now made possible with the X9. *Connect 3 external displays through the combination of HDMI, mini-DP and Thunderbolt™ 3 ports. 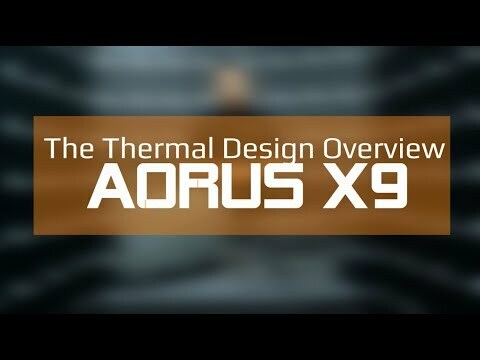 The AORUS X9 features an unprecedented Quad Fan cooling solution, working in tandem with the 8 heat pipes, making light work of the dual GPUs, CPU and Chipset heat output. The Quad Fan cooling solution was engineered to ensure high performance heat dissipation, making for a cool and pleasant gaming experience. The X9 comes with beasty looking vents throughout the chassis. They are not just for show. The uncompromised large sized vents and vent location is the key to sucking in large amounts of air, intelligent air distribution and dissipating all the hot air effectively. Giving you style and performance while you game. Beyond the specialized cooling chassis design, AORUS further adds an intuitive fan customization UI that will defiantly suit any gamer needs. Take control of the fan in different situations, with quiet, normal, gaming, customize and deep control profiles to choose from. Gamers can go even further with a fan curve, 10 stage fan control setting (deep control profile) that lets gamers assign different fan speeds to individual temperature for the ultimate fan tweak customization. With the X9, AORUS takes the portable stereo sound experience to the next level. While others go for 2.1 sound systems, with one subwoofer sharing the bass loads from two channels, AORUS covers the entire range for each channel, with a 2-way speaker architecture. On top of that, with most laptops having the speakers at the back of the laptop, the X9 has positioned the speakers and woofers to face the user for a direct sound experience. Enhance your audio experience with AORUS Audio. With 4 modes (games, music, movies, meeting) to choose from, the AORUS Audio provides you lifelike sound which allows you to immerse yourself in any usage situation. For example, the Game mode includes 4 other modes such as first-person-shooter (FPS) and racing and role-playing games (RPGs). Each sound is produced with accuracy and clarity, bringing the battlefield to life. Experience the joy of gaming on a true laptop mechanical keyboard in an unprecedentedly slim format or in a world’s thinnest laptop with true mech switches for that matter. The X9 offers specially designed Brown switches for performance and durability. On top of that, naturally featuring full per-key 16.7 million colour RGB backlighting and a variety of lighting effects to choose from. The X9 is a true portable gaming laptop that has it all. Craving macros? With the AORUS Fusion software, you can make any key or key combination into a macro, eliminating the need for dedicated keys. Cast spells or perform complex tasks with a single keypress. Each and every key can be customized to light up only the required keys for each application, allowing the user to instantly identify which keys to press. Gamers can go a step further and setup animated illumination effects like breathing, waves, ripples and much more. The Fusion app can combine audio, backlight, and macro settings to profiles, and switch automatically between games or applications. Taking the already powerful and customizable RGB fusion software found throughout the AORUS brand, AORUS has gone further and added extra functions just for the all-powerful X9. In conjunction with the multifunctional RGB Lightbar and surround RGB lighting. You will be able to control all the RGB lighting found thought the X9, all through AORUS Fusion. Selected from a multitude of material combinations, AORUS has come up with the most silky-smooth and robust trackpad to date. You will find a striking AORUS logo on the trackpad for extra aesthetics, with a unique procedure that reflects different colour shades as you look at it from different angles. *The colour option of the AORUS trackpad logo may vary. Please contact the point of purchase or reseller for more information. Features • World's Thinnest NVIDIA® GeForce® GTX 1070 GDDR5 8GB+8GB SLI Laptop. • 7th Gen. Intel® Core™ i7-7820HK Overclockable Processor. • World's Thinnest Chassis with True Laptop Mechanical Switches. • World’s First 17.3” Laptop with Quad Fans. • 17.3" QHD 2560x1440 120Hz / 5ms WVA Anti-Glare Display. • Exotic Design with Maximum Aluminium Coverage. • X-Rite™ Pantone® Certified Display. • Tri-Storage: Supports up to 2x PCI-E Gen 3 NVMe SSDs and 1x 2TB HDD. • Quad DDR4 Slots: Supports up to 64GB of DDR4-2400. • Quad Ports: Thunderbolt 3, USB3.1 Type C, Mini DisplayPort 1.3. • ESS Sabre Hi-Fi Audio DAC. • Quad Audio: 2x Speakers, 2x Woofers. • Unique central Multifunctional RGB HUD Lightbar and Chassis RGB Fusion Lighting. • AORUS RGB Fusion: 16.7 Million Per-Key RGB Backlighting. • Multi External Display Support: 3 Surround Display. • Versatile Fan Control: 10 Stage Deep Fan Control. • Xsplit + TriDef: Stream Like a Pro. • Killer DoubleShot Pro: Optimized Gaming Network. • Powerful AORUS Audio Software. • AORUS Exclusive: International 1+1 Year Warranty. • Game in a Greener Environment with Decomposable Packaging.